Ideally, students would have one portal with which they can access all online classes, no matter the course provider (e.g., Udacity, Coursera, edX, or a university). Here I’ve designed a Student Portal, where my fake student Mireya can see all the courses she’s taking, and upcoming due dates as indicated by bolded numbers on the calendar. Today, let’s say it’s May 29, 2013, she can see three activities she needs to do for her Human Rights and Global Health course, and the reading she must finish for her Shakespeare Through the Ages course. She should be able to click on these assignments to visit them directly. From her portal, she can also start a hangout or chat with peers she has “added” or “favorited” (much like social networking sites like Facebook or LinkedIn), edit her bio, browse new courses, search for contacts, or look for keywords in her course forums. She can click a course to go to that course site, but if she hovers over them, she can see the basic info and go directly to the syllabus. 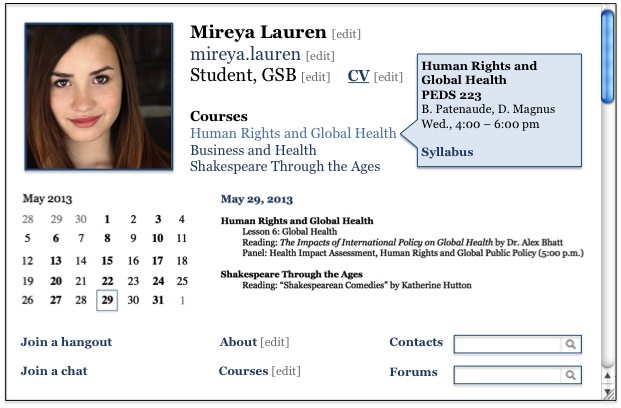 (Looks like her Human Rights and Global Health course is an in-person class with some online components.) Let’s say she clicks on Shakespeare Through the Ages.